Oktoberfest is kind of a new tradition in Norway – another proof of that the world becomes smaller and that habits and cultural occasions are adapted. Well, don’t misunderstand: even from the Viking period, Norwegians have celebrated harvest and made beer from grain and aquavit from potatoes. 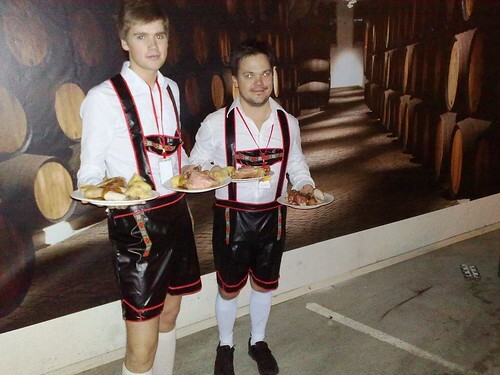 Great feasts were held to celebrate the harvest, it’s just that they didn’t call it Oktoberfest. occurred in Munich, on October 18, 1810: For the commemoration of their marriage, Crown Prince Ludwig (later King Ludwig I) and Princess Therese of Saxe-Hildburghausen (namesake of the Theresienwiese festival grounds) organized a great horse race (the marriage took place on October 12; the horse race on October 17 — therefore, there are different dates named as being the first Oktoberfest). Now it’s known as the Largest Volksfest (People’s Fair) in the World. In 1999 there were six and a half million visitors to Theresienwiese – most of them from Bavaria, but also from the surrounding EU countries and non-European countries including the United States, Canada, India, Japan, Brazil and Australia. Food: Haxn (knuckle of pork), Schweinsbraten (roast pork), Würstl (sausages) and of course Sauerkraut (cabbage). Drinks: Beer and snaps (Bommerlunder). 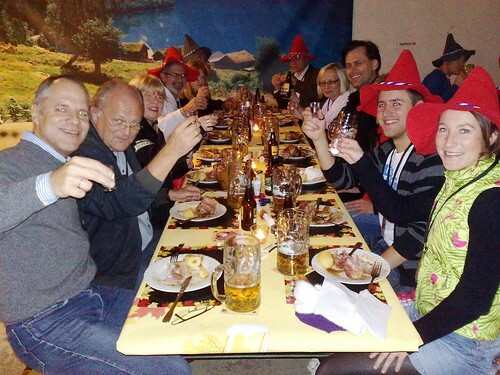 Some of my colleagues and other costumers of NetPrint’s: We all are party boys and girls in an atmosphere like this. My thanks to the host for making this an unforgettable feast! Talking about all that happens in Oslo, Norway – and what I try to give you a glimps of. Now you are able to take part and meet up with other bloggers to explore and experience yourself. I keep on planning for the Oslo Blog Gathering 2010 – don’t forget to mark your calendar! The food looks yummy! All of those things are available at our area markets, which speaks to the huge influence of German immigration to the U.S. My mother’s maiden name was Headrick, so I have German ancestors. Enjoy your Fall season, my friend. We’re to have frost tonight for the first time this season. I would have liked to see you in those cute little German shorts too!! Glad you had fun, next time bring me home some of those German sausages!! Ah what fun! I enjoyed the concert too. Oktoberfest is big here in Canada – especially around Kitchener, ON. There are Oktoberfest festivities a couple hours away in Kitchener/Waterloo next weekend. I had always thought is was in Munich only! I’m not a beer drinker at all, between us, I can’t even stand the smell. I guess something is wrong with me :lol: But I’d go for the picture opportunities and the atmosphere. On another topic, I was browsing the program for the Oslo BG and I must say I’m quite impressed by your organization. It looks very professional and I’d love to be here. Now, I’m having some trouble panning “that far” ahead but I must say I’m seriously considering it. That surely looks like a lot of fun!!! I love Oktoberfest. It’s a wonderful fun time. Looks like you all had a terrific time as well. Good for you. thanks for the invite to your 2010 blogfest :)..
sounds like it will be an amazing event!!! 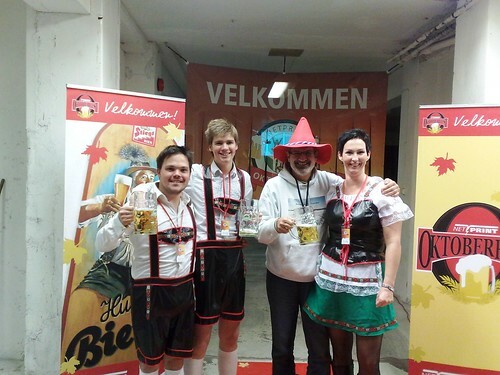 Sounds you had a terrific day at oktober fest!!! Thanks to share so well the atmosphere !!! I would want to taste a little of all that delicious beer!!! Based on the size of those beer glasses I’d say it was a party! I love this post and all you write! And this I thought very amazing! The video you put on you tube is very special too! Congratulations! I want to go to Norway as soon as possible hahahahahaha! Pic’s are great looks like a good time my friend He!He!He!.But for me i learnt a lot here.Thanks once again :) . I hope next year you dress up too. Awesome event Renny! I like the pictures and ooohh that’s a nice looking sausage! I saw the OsloBG page and it looks great! I will post about by the end of this week! Do you think that the HTML code would fit the sidebar? So far it looks pretty good and well planned; I am waiting to read more about it! Anyway, nice party going on here lol: you do know how to have fun!! Haha, we import lot’s of traditions orginated other places here to Oslo. At least those that can give us an excuse to Party, like St. Patrick, Halloween, Valentine etc. May be it’s not that strange since Oslo is very cosmopolitan. btw. I’m no able to post photos again, and we continue our jurney to south of France. And still wait for Baby Vagabond. If nothing have happened until Monday, then with help of medicins it will happen. You know we really hope you can join us and thanks for all your support! Sounds like fun and where are the lederhosen??? I would love to be at the bloggers’ gathering next year. When are you thinking of having it? Summertime, I hope. I can’t buy warm enough clothes in Queensland. good going, I bet you had fun. 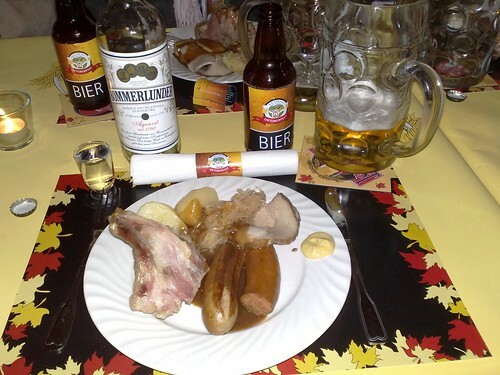 Good bier, good Bavarian food. The sausages and meat looks so tempting! I need to get me some German sausages and pork knuckles! I see! So ‘Oktovberfest’ means “Festival of October” if I understand this post right. The peice of music is charming and the whole idea of the festival! Thank you.This festival is a idea of enjoy with nature.I love it.